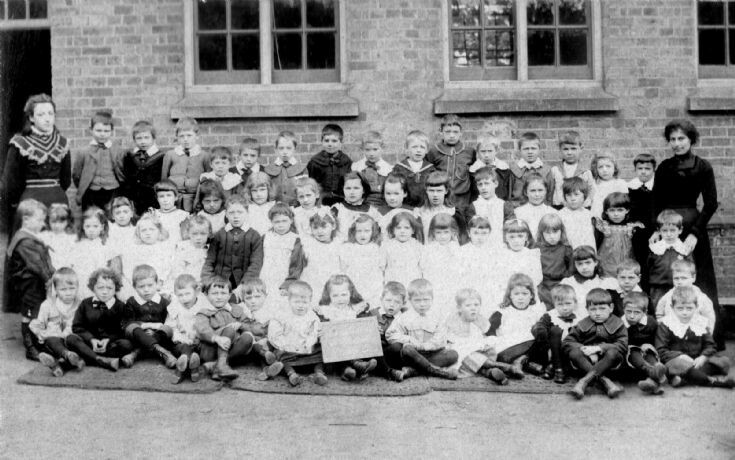 This is an early photograph of Handcross school in about 1901 showing 61 children under the charge of two teachers. The headmaster at that time was Mr James Albert Edwards who died in 1907. Some of the older schoolchildren formed a guard of honour at his funeral at Slaugham. See picture #576. My great-grandfather was Charles Thomas Dudley, a blacksmith in Tilgate Forest Row, Pease Pottage, next door to the old post office, see picture #166. His eldest son, my grandfather, Thomas Silas Dudley, continued the trade and my sister and I think he is sitting in the back row, third from the left. I've been researching my family tree. Thomas Silas Dudley is my great-grandad. His daughter, Eileen Dudley, was married to Ernest Foster and was my Nan. I am wondering if there is a list of names of the pupils in this photo. My grandfather is Peter Hole and lived with the watchmaker, Henry Elliott, in 1901 at Handcross. See picture #137. Janice, I fear that no such list exists. But, if anyone reading this can supply any more names please would you make contact. I have similar photographs from the first decade of the last century still to upload but only ones from 1909 onwards have names attached. Your grandfather's name does not appear, but in 1909 he would have been 17 and have left by then. Just by chance, do you know at what age was it common to finish school? Since the late 1800s the leaving age had been 12, but in 1910 there were plans to increase it to 14. Many young people found it hard to see the benefits of another 2 years in school. As it turned out, the leaving age was not increased to 14 until 1918, after the end of the Great War. In 1947 it was further increased to 15, and in 1972 it was increased to 16. These were the minimum requirements, and often children stayed in school for a year or so longer. Thank you, Barry. You are very kind to help with so much information. I hope you don't mind another question. Do you know if watchmaker, Henry Elliott, always lived at Oakley Cottages. I am mostly interested in 1901. Henry Elliott was born in Havant in about 1849. The census returns tell us that in 1851 and 1861 he was living in Havant with his parents and siblings. In 1871 he was living in Billingshurst with his wife, Emma, and 1 daughter. By 1881 he had moved to Handcross in the High Street, but on the west side as the return indicates that he was living in the Slaugham parish. In 1891 he, with his wife and 4 children, had moved across to the east side of the High Street as indicated by the census return which was issued in the Cuckfield Rural Parish. Presumably they were some of the first residents of the newly-built Oakley Cottages. In 1901 he was living in 1, Oakley Cottages with his wife, 1 daughter, and “boarders” James (11), Peter (9), and Edwin Hole (7). In 1911 he was still there, with a niece and nephew, but no wife. He died locally in 1935, aged 86. The matter of the boundary between the parishes of Slaugham and Cuckfield is dealt with in picture #92. Thank you again Barry. This information you have so kindly provided proves that my grandfather and his 2 brothers were definitely boarding with Henry Elliott at 1 Oakley Cottages in 1901. It's very exciting to actually see a photo of the man who took the boys in and where they lived. My grandfather, Peter Hole, joined the army in about 1906 by putting his age up 2 years. Do you know where he would have enlisted if he was living at Handcross?. I can't find any information of his enlistment anywhere. I am sure you already know that Peter Hole was born and baptised as Peter Ernest Hole, and that he served in the 85th (Howitzer) Brigade of the Royal Field Artillery under the name of Ernest Peter Hole! Such are the problems of searching for family history. In 1914, Crawley had very large rallies to enlist soldiers for WWI; go to crawleyobserver.co.uk and search for "young heroes" at top right. However I doubt that your grandfather would have been able to enlist in that small market town of Crawley in 1906. Perhaps details of his enlistment was on his army record, but many of these records were destroyed in 1940 in a large fire caused by a German bombing raid. I have come to the conclusion that his army record must have been one of the many that were destroyed in the fire. I have his medal details but many hours of searching has produced nothing. I will keep looking though. How come Daphne Gates lived in the cottage that once belonged to Thomas Dudley/Charles Dudley. Is there a piece of family tree missing regarding marriages and descendants? Mike, there is a link between Daphne and Charles and Thomas Gates, but it’s somewhat complicated due to second marriages. Are you sitting comfortably? Then I’ll begin. Daphne’s maternal grandmother was Emma Jane Hanley (née Beare). After Emma’s husband (Matthew Hanley) died in 1910, she married Charles Thomas Dudley in 1916. So the link is Emma. By her first marriage she became grandmother to Daphne, and by her second marriage to Charles Thomas Dudley (also in his second marriage) and his eldest son, Thomas Silas Dudley. I ought to declare an interest. My paternal grandmother was the sister of Daphne’s father! Ta. I am still confused. I got Daphne as a daughter of Lelia May Fippard (née Dudley). She was one of many children of Charles Thomas Dudley from his first marriage. Her maternal grandmother would be Mary Ann Dudley (née Caine). Most of my information came from my Aunt Irene, a late sister of my mother, Lily Joan Dudley. Could there be two Daphnes? I will retrace my sources, I might have tripped up somewhere. Yes, two Daphnes it seems! Lelia's (known as Lily) daughter was born on 30th December1923 as Daphne Margaret Fippard. It seems Daphne married a Jim Warnford in 1958 and died on 4th February 2010, aged 86. Daphne Gates from Woodbine Cottage, Tilgate Forest Row never married and was always a Gates! Within the last couple of years Daphne has moved from the cottage and now settled into a nursing home in Horsham. Ta. A new avenue to look at, the Hanleys and Gates. My mother, Lily Joan Dudley, and her late brother, Albert, kept in touch with Daphne Gates after meeting her in September 2007. It is the cottage my mother remembers most because as a girl she visited her grandfather, Charles Dudley, in the late 1920s and 1930s. My mother is in her 95th year.